I spent the vast majority of my life living in the great Commonwealth of Massachusetts. Now living on the edge of the prairie in Kansas – just across the river from the great city of Kansas City, MO, I often wonder how I got here and long for those days gone by in the Bay State. 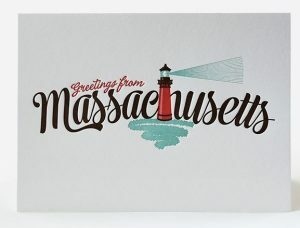 Which is why I have fallen in love with this Massachusetts letterpress greeting card I found from the fine folks at Elum. Find the Massachusetts letterpress greeting card from Elum here. See all the great letterpress cards and other items from Elum here. Lost Cowboy is powered by	WordPress 5.0.4 and delivered to you in 0.856 seconds using 40 queries.